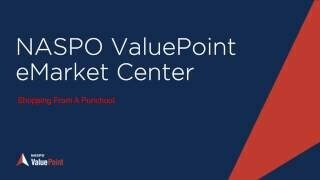 The NASPO ValuePoint eMarket Center is an FREE online shopping tool that provides all NASPO members and their eligible entities with a user friendly e-commerce solution for accessing and purchasing from their entity specific NASPO ValuePoint Cooperative Contracts. For example Utah’s Participating Addendum may restrict office supplies to only pencils and pens, where-as Nevada’s Participating Addendum may allow all office supplies. A school district in Utah would only see the pencils and pens allowed and a school district in Nevada would see all office supplies. If you would like to know more about the eMarket Center, please contact help@emarketcenter.org.